Their intervention at the beginning of the war was massive and devastating, but it would prove insufficient to beat General George Washington and his patriotic troops to the finish line. The German mercenaries and the Loyalists, their back against the wall, were forced to leave, in 1783, what was already being called the United States of America. This German contingent of hired soldiers represented about one quarter of all the soldiers Britain sent to America during that war. The Continentals were fueled up by Britain’s decision, saying that the British were not fighting on the same level playing field and that Germany should not get involved in their domestic matters. It has certainly contributed to convince undecided citizens to swap their shovel for a gun. Suddenly, Rebels became Patriots (Continentals) and the war reached its cruising speed in no time. For the German mercenaries, the end result was devastating in many ways. Of the total number of 30 000 German mercenaries who crossed the Atlantic, only 17 313 returned to Germany. The number of casualties amounted to 7 700: 1 700 were killed in action and, surprisingly, 6 354 died due to illness or even accidents. Approximately 5 000 settled in Canada and in the United States, because many decided to fight for the other side after awhile. (The statistics about the Germans in the ARW vary slightly between sources). One of these German mercenaries was lucky to get out of it alive; otherwise, none of us, the Longs/Langs of Clair NB, would be here today. This German mercenary has been the most talked about member of my family, that is, Philip Long. A mercenary soldier is one that fights for a salary and not necessarily for a higher noble cause. Still, I don’t know any war that is of « noble character ». Why did Britain hire German mercenaries? George III of Great Britain, in 1775/1776, desperately seeking to retain control of British North America, signed treaties with a number of German states to supply troops to defend the English interest in this part of the world. The significance for the genealogist in North America is that approximately 6,000 soldiers remained on this side of the Atlantic Ocean, some 2,400 in Canada and the remaining 3,600 in the USA. It has been estimated that several tens of thousands -or millions ?- of Canadians and Americans can trace their ancestry back to one of these soldiers. It has been estimated that 1,400 Hessians settled in Québec, and about 1,000 in the Maritime Provinces and Ontario. Many authors have suggested that, if it were not for the presence of the German forces, Canada would not exist as a separate nation today. Despite the English defeat and loss of the 13 colonies, England did retain control of the northern territory. The military strength of Britain was inadequate to suppress the American uprising. It therefore turned to its former allies of the Seven Years War for support, several German principalities. In the 18th century, Germany was a patchwork of independent states, each with its own ruler. Many heads of states were related to British Royalty in one fashion or another. George III signed treaties with six German states: Braunschweig (Brunswick), Hesse-Kassel, Hesse-Hanau, Anspach-Bayreuth, Anhalt-Zerbst and Waldeck. 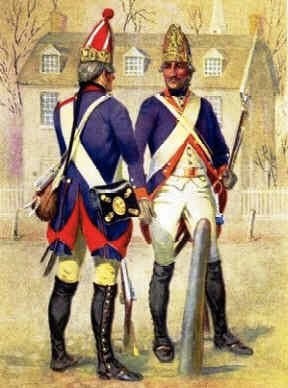 As Hesse-Kassel provided the largest contingent of troops, the German forces became known generically as "Hessians". Hesse-Kassel supplied the largest number of troops by far. Approximately 17,000 soldiers were sent to America, representing about 1 out of 4 able bodied men of military age of the population of that state. The Hesse-Kassel troops were considered superior to those of the other German states. They were well trained on the Prussian system and in good health. The treaty signed between George III and Frederick II, Landgrave of Hesse-Kassel, was a lucrative one for the German Prince. He would be paid an estimated £3 million over an eight-year period for the services of his army. It was also the 6th time in 100 years that the Landgrave of Hesse-Kassel had rented out his troops. Thus, the common soldier could hardly be considered a "mercenary". He received his regular soldier's pay from the Hessian army; the Landgrave received the benefit. Hesse-Kassel sent 15 Infantry regiments, each consisting of 5 companies. The strength was 650 officers and men. Also sent were 4 Grenadier Battalions, 2 Jager companies and 2 Field Artillery Companies. Regiments were often named after their "Chef", but not always. Each regiment, when stationed in Germany, was located in its garrison town. For example, the garrison town of the von Knyphausen regiment was Ziegenhain. This can be important for genealogical research, as the church records for the garrison town could contain information on your ancestor. The Hesse-Kassel forces spent most of their time in the 13 Colonies. They arrived in New York in August 1776 and departed in August 1783. They participated in every major battle of the war, including the battle of Trenton where many were killed, wounded or captured in the American victory. In September of 1779, the British, fearing an attack on Québec, ordered the von Kynphausen and von Lossberg Regiments to Canada. The fleet was struck by a severe storm and many ships were lost or captured by the Americans. The remainder of the fleet found its way to Québec, although not until June 1780. One part of the von Knyphausen regiment had to spend the winter in Prince Edward Island, and then resumed its voyage to Québec the following spring. The Duke of Brunswick (German = Graf von Braunschweig), also related to the British Royal family, dispatched about 5,700 troops throughout the Revolution. These forces were organized into 7 regiments or battalions and 1 Yager company and were stationed in Québec. 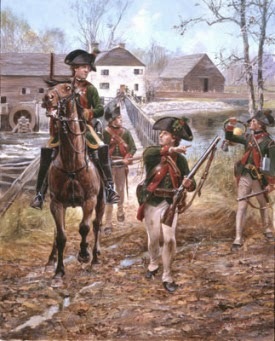 The first division arrived in the summer of 1776 and the troops left Québec in the summer of 1783. They were under the command of General von Riedesel. 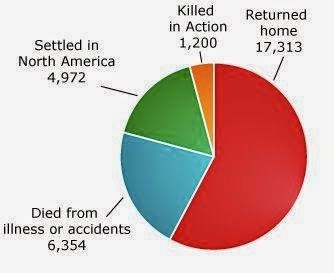 It is estimated that 700-800 of these soldiers chose to settle in Canada. 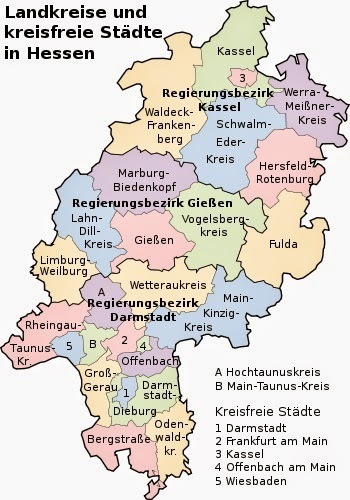 Hesse-Hanau, Anhalt-Zerbst, Waldeck and Anspach-Bayreuth. The treaties signed with these principalities called for far fewer troops than with either Hesse-Kassel of Brunswick. Hesse-Hanau contributed about 2,000 soldiers and Anhalt-Zerbst about 1,100, with Anspach-Bayreuth about 2,300 and Waldeck 1,225. Only forces of Brunswick, Hesse-Hanau and Anhalt-Zerbst were stationed in Canada. Most of the soldiers who settled in Canada or the USA either deserted from the British side, or were allowed to remain behind by their superiors. There are an unknown number of soldiers who returned to Germany, only to return to this side of the Atlantic at some later date. Soldiers who chose to settle in Canada were often given land grants, and depending on the jurisdiction, were treated as well as the Loyalists.